A group of space ophthalmologists inspect the eye of a brand new spacecraft which is going to see farther, and going to take better images of our universe, than any of its predecessors. So what is going on in this photo taken in May, 2014? 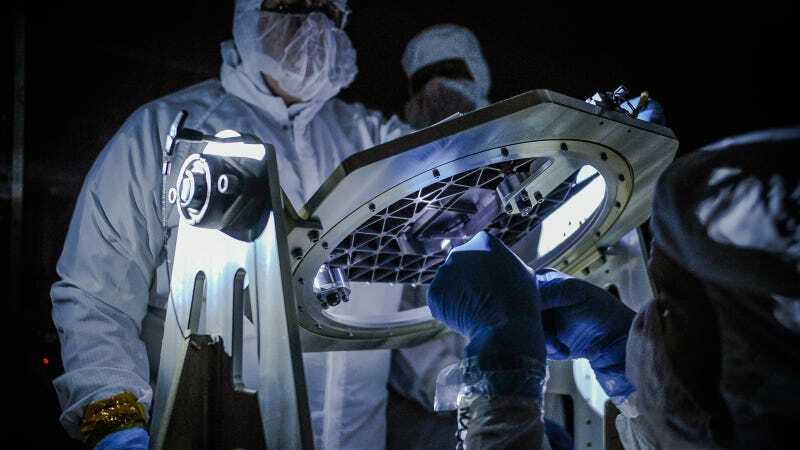 NASA engineers inspect a new piece of technology developed for the James Webb Space Telescope, the micro shutter array, with a low light test at NASA's Goddard Space Flight Center in Greenbelt, Maryland. Developed at Goddard to allow Webb's Near Infrared Spectrograph to obtain spectra of more than 100 objects in the universe simultaneously, the micro shutter array uses thousands of tiny shutters to capture spectra from selected objects of interest in space and block out light from all other sources. You can find more photos about the NIRSpec microshutters in this Flickr set.